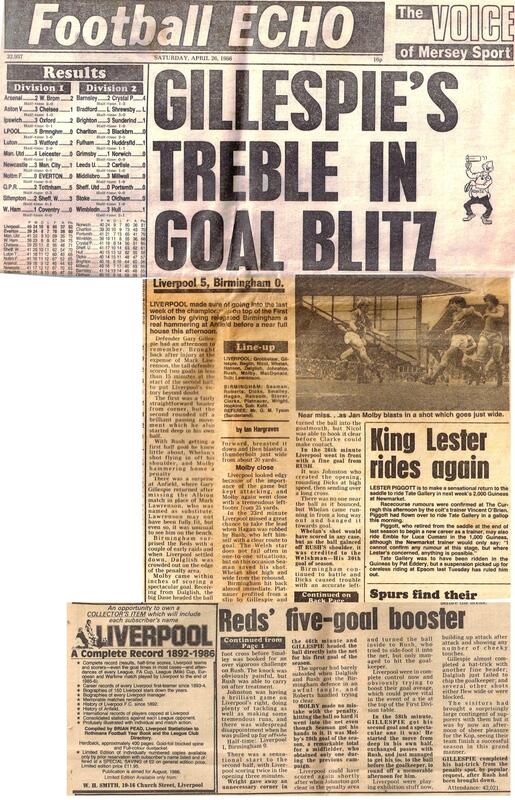 Gary Gillespie - Best eight years of my life - LFChistory - Stats galore for Liverpool FC! LFChistory had the rare opportunity to chat to Gary Gillespie, an influential member of one of the great Liverpool sides of the 1980s. He very generously provided us with a great insight into his footballing career, from the early days of captaining Scottish minnows Falkirk and breaking a world record in the process, right the way through to joining his boyhood club Celtic at the age of 31, after a strange managerial decision by the then Liverpool boss, Graeme Souness. Gillespie is now a regular member of the commentary team on the official Liverpool F.C. TV channel. Gillespie played 214 times for Liverpool and was part of three League championship winning sides, however; unfortunately a series of injuries blighted his career. Nevertheless, Gary Gillespie still had the ability to break up one of football’s greatest ever defensive partnerships; Alan Hansen and Mark Lawrenson. "Yeah, that's right and it was quite a shock. At the time it was like a world record wasn't it? I'm not 100% sure if that still stands today, though. Falkirk had fallen into hard times and we were struggling a little bit. The manager at the time was Billy Little who had actually been my English teacher at school and also my next door neighbour as well, so whether that had any sway into the fact I was made captain, I'm not sure. He probably picked me because I was the one guy who was going to get a regular slot in the team." "I never really grasped anything like that, it was just the case of going up and tossing the coin to decide what way we were going and that wasn't any great deal for me. I had no influence with regards to the dressing room. There were far more senior players than I was there. I only played 22 games for Falkirk and I could have only been captain for maybe 10 of them. There was no youth or reserve system at Falkirk; you just got thrown in at the deep end. You either sink or swim, and fortunately for me, I swam. For 6 months I was working at a bank part time and also playing for Falkirk. Then obviously, the opportunity came to go full time at Coventry City. This was a massive step for me. Growing up as a kid, all I wanted to do was play football at the highest level. Therefore, moving to Coventry City was undoubtedly, the right step." On the 16th September 1978 you played at Anfield for the first time as an 18-year-old for Coventry City. "Certain things in football you forget everything, but for some reason, I remember this day very clearly. Gordon Milne was manager at the time and I always remember we stayed out at the Post House hotel out in Haydock. Bill Shankly came for pre-match lunch with us. Of course the tie up was Gordon had been a player under Shankly. He actually ended up traveling on the bus into Anfield with us. We got there slightly more than an hour before the game. Shanks got off the bus with us too and led us into Anfield." Did you introduce yourself to the great Monarch of Merseyside? "Not personally, however, just to be sat down at the same table, literally opposite each other, being in the great man's presence was so special in itself. Listening to him talking about football was fascinating for a young lad like myself. He was one of those great oracles that you could just listen to for hours and hours on end. I even remember he had that brown suit on, an orange shirt and a red & white striped tie. Well his dress sense wasn't fantastic was it? (laughs) That was Shanks; a great aura with a great personality." Were you fazed by the fact you were about to play against the double winning European Champions at such a young age? "I remember going out to inspect the pitch and the first thing I did was look at the Kop. It was rammed packed even an hour before kick-off and I remember thinking to myself, it can't possibly get any fuller! I remember being very nervous as a young defender as I didn't want to make a mistake and let the side down. We lost the game 1-0, Graeme Souness scored. We hardly got out of our own half to be honest, so I was mega busy, however, it was a fantastic experience." You went on to play another seven times against Liverpool for Coventry City from 1979 to 1983, against some of the greatest players of all time, who stood out for you? "There were so many but Dalglish was special. If anyone asks me who the best player I played against was, I always say Kenny Dalglish. He was outstanding, he could make goals, score goals, and was always a handful. The best Liverpool team I ever saw was of the 1978/1979 season, when they went all season conceding just 16 goals and only four at Anfield. They had Phil Thompson and Alan Hansen at the back, Souness in the middle with Terry McDermott and David Johnson played up front more often than not with Kenny. A fantastic side, almost unbeatable so it was a great experience to play against them." In 1983 you wanted to progress and it's known that you did hold talks with Arsenal, however, soon after, Joe Fagan wanted to make you his first-ever signing and you chose Liverpool over London. "Coventry at the time had nine players out of contract and it was, kind of, a dodgy period for them. Coventry did offer me a great new contract with more money to stay with them than Liverpool would end up offering me. Nevertheless, I went away to talk to Stoke and West Brom and I talked to Arsenal, Terry Neill was manager and Don Howe was there as assistant, we had a chat about what both sides wanted and could offer each other. However, the very next day, after coming back up from Arsenal to think about my future and consider the various options I had, Bobby Gould, who had just taken over as manager at Coventry, phoned me up. He informed me that Liverpool wanted to talk to me and if I was interested or not. Interested I thought to myself, I would have crawled up there if I had to!" "Anyway, I drove up to Anfield in my Sky Blue Talbot with Coventry City sticker sponsors splashed all over it. We ended up going to the St George hotel opposite Lime Street station. Joe Fagan was there with Tom Saunders, Peter Robinson and Geoff Twentyman. I think even Bob Paisley was there as well. We had lunch, myself, my wife and my little lad and they basically offered me a contract. It doesn't matter who you are or how much they are offering you, any contract offered to you by Liverpool Football Club in them days was impossible to turn down!" Did Joe Fagan give you any guarantees regarding what would be your position in the squad or how often you were likely to play? "No, nothing of that nature was discussed. Nonetheless, regardless if you’re going to be playing or not, I think every player signing for a new football club has to be realistic but also optimistic at the same time. If they want to sign you, you’re going to be playing but sadly that wasn't the case. I spent two years in the reserves on a regular basis, but to be fair; being at Liverpool was a good grounding for me." How much did you learn from Joe Fagan? "Joe Fagan was a fantastic man and an exceptional servant to Liverpool Football club. However, I think more so in them days you tended to learn more from your peers and your teammates, rather than from the manager and the coaching staff. Back then at Melwood we didn’t do much tactical drills etc, we played a lot of games and all the tactical stuff was accomplished within the games we were playing in. Subliminally, you were learning things that you should have been learning. You were very rarely taken aside as an individual, as a back four or a midfield; you were just taught how to be a Liverpool player and if you didn’t learn you were quickly shown the door! So that’s how it was back in the day." Gillespie's debut for Liverpool against Walsall in the League Cup on 7 February 1984 was not the best as he recalled in a previous interview: "There was a big pressure to perform and we were expected to hammer Walsall. At one point I was trying to clear the ball off the line. It smacked Phil Neal in the back and bounced in for an own goal. Nealy gave me one of his stares." Liverpool won the European Cup in the 1983/84 season and Gillespie didn't get much of a look-in with Hansen and Lawrenson firmly in place in the middle of defence. In 1984/85 Gillespie made 24 appearances, including 19 starts and scored his first goal against Newcastle. "To tell the truth, I found myself getting quite frustrated that season. I think Lawro and Al picked up a few injuries and I was coming in and playing well. I thought to myself, I would have liked to have stayed in the side after that, but when Lawro and Al were fit, I was always shifted back out. The Al and Lawro partnership was such a hard partnership to break and then keep separated." "This frustration and disappointment even brought me to go and speak to Joe Fagan himself, as I felt when I came into the team our form didn’t drop and I was playing good football. He obviously saw my point of view and to a certain extent I could see his as well. Let's be honest, the Lawrenson and Hansen partnership was sensational. However, it didn’t do me any good as I wasn’t playing and keeping my place in the team. I was 24 coming up to my peak and wanted to be playing regularly. My ambition in football was always to play at the highest level, and if it wasn’t going to be for Liverpool then I’d have to look for other options." "Anyway, that’s the way the conversation went. I don’t know if you would call it a transfer request, it was maybe more of a 'I want to be playing'-plea. Joe didn’t do anything about it and just left the conversation in mid-air and was never mentioned again! Heysel passed and I think everyone knew Joe was going to retire and with Kenny taking over I decided to stick it out and the following season after initially getting over a couple of Achilles tendon injuries in December 1985 I got a regular spot in the side. It was then when I felt, I was finally part of the first team." In April 1986 Rushie got brought down by Julian Dicks; do you know the game I’m talking about? (Gary laughs and says No!) You had already got on the scoresheet twice that afternoon against Birmingham. How did you feel when the penalty was awarded and the Kop started to shout your name? "It was kind of bizarre actually, because that season it was nip and tuck with us, West Ham and Everton going for the league title. A couple of weeks before the Birmingham game, Paul Walsh had an opportunity to get a hat-trick from taking a penalty. Walshy missed and when we got back into the dressing room Ronnie Moran went absolutely berserk at him, as at the time it was thought the league could be decided on goal difference. He really went mad with him. If Ronnie had any hair left he would have been pulling it all out. Anyway, as you said, Rush won a penalty when the score was 4-0. I could hear the Kop shouting my name. I glanced over to Ronnie Moran stood on the touchline and he was shaking his head. Kenny was on the pitch as player manager, so it was him who actually told me to come forward. So, I ran forward to take the ball off the manager and with Ronnie Moran on the bench shaking his head at me, I felt rather nervous. Fortunately, for Liverpool and myself it went in and that season Liverpool went on to win the double." You played an even bigger part in the 1986/87 season and is it fair to say the greatest testament to your ability was when Dalglish was forced to move a fully-fit Mark Lawrenson to full-back to accommodate you alongside Hansen. "Absolutely, it was a great testament to my playing ability that I finally was able to cement a place in the starting XI, as Lawro went to play at full-back. However, occasionally we did play as a back three unit as well, as Kenny did like to mix it up a bit. As I said, the run into the double season in 1986 was when it felt like I had established myself in the team and the following season is when I considered myself a first-team regular." Your teammate, friend and then manager Kenny Dalglish left the club suddenly after the 4-4 draw with Everton in February 1991. Did you see Kenny's departure coming? "Not at all, I didn't see it coming, nobody did. I'd say, at the time, myself, Steve McMahon and Alan Hansen were the closest to Kenny and we had no idea whatsoever. It literally came out of the blue to us three and the rest of the players working with Kenny on a daily basis. He obviously, had been a little unwell and felt the pressure. He later told me what finally broke the camel's back for him; he was finding it difficult to make key and decisive decisions that he could previously make with ease. This inability to make these decisions in the way he wanted was probably the trigger for Kenny to step down. Knowing Kenny, he would have thought this wasn’t the way forward, neither for himself nor more importantly for Liverpool Football Club. "Liverpool back then never finished outside of the top two, so it was the pressure that he put under himself. If a modern day manager was doing what Kenny was doing he would be the best manager in the world, so it wasn’t the pressure of the team doing badly but the pressure of maintaining Liverpool as England's top club." "I also remember a week prior to Kenny’s departure we all went out for dinner in Southport, which a few of the players and our wives used to do after the games and this didn’t really change when Kenny was made manager. We’d been out at a Chinese restaurant and Kenny and Alan Hansen entered into; let's just say a difference of opinion. Anyway, Kenny ended up losing it with Alan Hansen. Alan and him were and still are best of friends, so witnessing this was one of those kind of like; stand back kind of moments. I don't know if this would have influenced his decision or not, but Kenny would fall out with his shadow at times but never with Alan Hansen." "The Arsenal game was a strange sort of experience as Ronnie Moran was now the stand-in manager. However, going back to the things I was saying to you before, when Joe Fagan was in charge, it was more about the players than the manager back in them days. We still had the same squad of players and did our best for the supporters. In spite of this, we did lose the first three games on the bounce without Kenny. Maybe at the time we didn’t realise we were a bit rudderless because our main man has gone which all came as a massive shock to us." Shortly after Graeme Souness took over from Ronnie Moran in 1991 you joined boyhood idols Celtic. Were you disappointed that Graeme didn't have the same confidence in you as Kenny did? "We had gone away for pre-season. We always used to go to Scandinavia and it was on that tour that I found myself never starting games as Liverpool had just signed Mark Wright from Derby County. In them days we used to travel away with the press, and a couple of the press guys were telling me about some rumours that were flying around that Celtic wanted me. This is way before the days of agents so you didn't really get to find out anything until the manager or the club told you directly." "Graeme didn’t discuss anything with me about my future on the trip. However, we used to play a game at Anfield on the Tuesday before the start of every season, which was a mixture between the reserves and first-team players. The manager pulled me aside after that game and told me he wanted to make me number one centre-back alongside Mark Wright which I found a little bit strange as I hadn’t played in hardly any games during pre-season. He knew I struggled with injury and he even started telling me his idea of getting physiotherapist and coach Phil Boersma to set up a specific training plan for myself in order to increase my muscle strength. I told him I thought that was great and thanked him; however, here comes the interesting part. The very next day I was approached by Roy Evans telling me the manager wanted to see me in his office. He basically told me the club had accepted an offer for me from Celtic and he gave me the freedom to discuss personal terms with them." Therefore I think you would agree you were left with little choice then? "Exactly, so I went with my financial advisor up to Scotland to see Liam Brady at Celtic. I thought about it, but as a Celtic supporter it wasn’t that easy for me in that respect. Celtic were obviously a massive club but they were lost at that time, so for me it was the wrong time to join. They were in turmoil amongst all the directors and the stadium needed redeveloping. Therefore, looking back it was probably the wrong time to leave Liverpool, especially with the Premier League era about to start." "I did have one year left on my contract at Liverpool so I could have easily stayed if I had wanted to. However, if one minute the manager is telling me he wants to make me his number one centre back and then five minutes later the club accept an offer from another club, suggested that the truth was, he probably didn’t want me there. That’s how I looked at it, that’s how I understood it and that’s why I signed for Celtic." "I think Graeme has since regretted his decision to have me sold, not only with myself but also with the likes of Peter Beardlsey, Ray Houghton and Steve Staunton. He probably now realises he got rid of these players a little bit too early." Gary, you won the league three times with Liverpool, played 214 games and scored 16 goals. Are you happy with your achievements at Liverpool? "I would have loved to have played more games. The first two years I could understand, with the Hansen and Lawrenson partnership. Also injuries blighted my career really, which was really disappointing. Nowadays I’d probably have played a lot due to the rehab and medical side to clubs. When I was at Liverpool we literally had nobody; we didn’t even have a physio apart from Roy Evans and Ronnie Moran that is! So it was a bizarre situation, but who is to say that way wasn’t wrong? Liverpool were winning absolutely everything back then including four European cups so they were obviously doing something right."